During the War, Peter was evacuated to Pocklington but missed his Grandma so much that she took him back to Hull. This proved to be a lucky move as shortly after he had left Pocklington, the house he had been staying in took a direct hit from a German bomb. On leaving Hymers, Peter wanted to pursue his dream of becoming an actor but felt obliged to follow in his father’s footsteps and so became a commissioned officer in the Royal Engineers. He met his wife June in the late 1950’s when she was appearing on stage and married her in 1960. They set up home in Esher, Surrey, and had 3 daughters, Susan, Elisabeth and Victoria. (Sadly Susan passed away in 2007 following a battle against cancer). Peter left the army and taught computer science in the local college. He also worked in London for NCR in sales and marketing, a job he really loved. The family moved to Hampshire in the 1970’s, and Peter re-ignited his love of performing. He joined the Andover Old Time Music Hall Society, taking on the role of Chairman and starred in many productions over the years. After his beloved June died in 1987, Peter set up a social club for divorced, single and widowed people. It was extremely popular and led to the marriage to two members. He also became a “recording artist” for the Talking Newspapers for the Blind, bringing the written words to life through his use of different accents and funny voices! About 10 years ago, we took a trip together to Hull. Peter showed us where he had lived with Grandma and Grandy, the Carlton cinema (where he watched his “Flash Gordon” films), and, of course, where he went to school. On the day we visited Hymers, Peter wore his old school tie and the Headmaster kindly invited us in. It had been over 60 years since he had been a pupil, and he thoroughly enjoyed showing us the school and re-living his memories. Towards the end of his life, Peter developed Vascular Dementia. This robbed him of recalling daily events, but his long-term memories remained crystal clear. His quick wit, sense of the ridiculous and love of performing also never disappeared. Peter remained independent right up until the last couple of weeks of his life, and he was an absolute joy to be with. We were blessed to have had him as our father. Alan Clarkson (at Hymers 1944 – 1949) died on 21st November 2017. Maurice Dalton (at Hymers 1945 – 1950) died 15th February 2017, on his 83rd birthday. 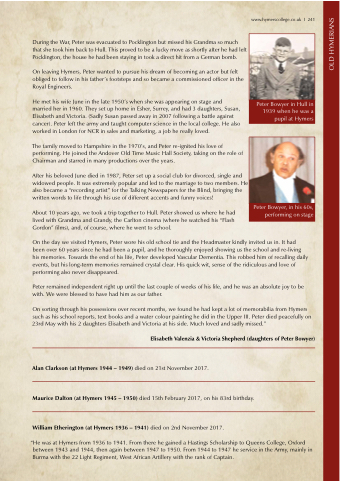 William Etherington (at Hymers 1936 – 1941) died on 2nd November 2017. “He was at Hymers from 1936 to 1941. From there he gained a Hastings Scholarship to Queens College, Oxford between 1943 and 1944, then again between 1947 to 1950. From 1944 to 1947 he service in the Army, mainly in Burma with the 22 Light Regiment, West African Artillery with the rank of Captain.